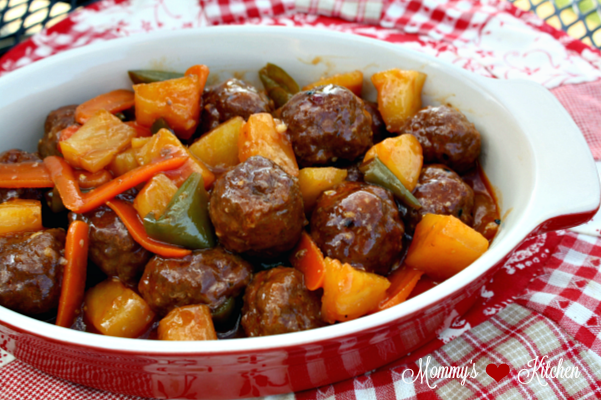 Homemade meatballs in a tangy sweet & sour sauce with bell peppers, onions, carrots and pineapple. Happy Monday everyone!!! Today I want to share a simple dinner or party appetizer with you. Meatballs have always been a favorite in our house. Whether I serve meatloaf meatballs with mashed potatoes or piled high on a plate of spaghetti my family loves meatballs. 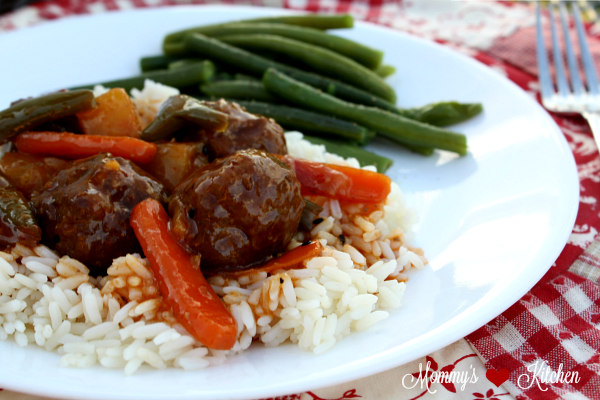 Since meatballs are my youngest son's favorite I try to incorporate them in several recipes, so today I want to share a simple recipe for Sweet & Sour Meatballs. The best thing about these meatballs is that they work well as a dinner meal served over rice or as a party appetizer for entertaining. Most recipes I've seen use frozen meatballs, and that's OK if you're short on time, but homemade meatballs are so much better, and they hardly take any time to make. The sauce for this recipe is a tangy sweet & sour sauce with the addition of bell peppers, onions, carrots and pineapple. Let's get started on the recipe. These are you will need: For the meatballs: ground beef, minced onion, bread crumbs, one egg, milk, simply Asian seasoning, salt and pepper. For the sauce: Soy sauce, sweet and sour sauce, Simply Asian seasoning, pineapple chunks with juice, minced garlic, green pepper slices, carrot slices, onion slices, brown sugar and cornstarch. Preheat oven to 350 f. In a large bowl, mix all the meatball ingredients together. Use small cookie scoop to form meatballs. Place all the meatballs on a large baking sheet (sprayed with non stick spray) and bake for 25 minutes, drain meatballs on paper towels and set aside. 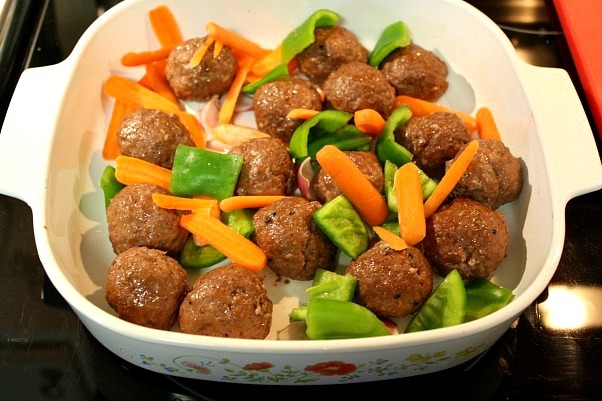 In a 13 x 9 inch baking dish or similar add the meatballs, onions, green peppers, carrots and pineapple chunks. Pour the sauce over the meatball mixture and bake in a 350 degree oven until bubbly and the sauce starts to thicken about 20-25 minutes. Serve over brown or white rice or serve as an appetizer. Preheat oven to 350 . In a large bowl, mix all the meatball ingredients together. Using a small cookie scoop to form meatballs. Place the meatballs on a large baking sheet (sprayed with baking spray) and bake for 25 minutes. Drain meatballs on paper towels and set aside. In a medium size bowl, mix together the brown sugar and cornstarch. Add the soy sauce, sweet and sour sauce, minced garlic, simply asian seasoning, and pineapple juice; mix to combine. 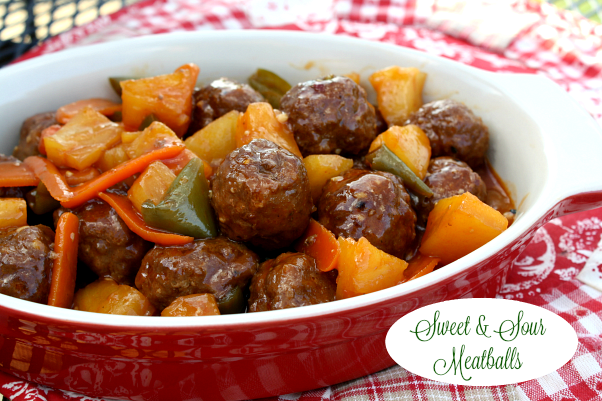 In a 13 x 9 inch baking dish add the meatballs, onions, green peppers, carrots and pineapple chunks. Pour the sauce over the meatball mixture and bake in a pre heated 350 degree oven until bubbly and the sauce starts to thicken (about 20-25 minutes). How to Freeze the Meatballs: Form the meatballs using a small cookie scoop so they're evenly shaped. Place the meatballs on a large sheet and flash freeze them for one hour. Remove the meatballs and add them to a large freezer bag. Date the bag and place in the freezer. Flash freezing the meatballs keeps them from sticking together in the freezer bag. We love sweet and sour....we love meatballs.....so WINNER! This recipe sounds so good and easy. Love the idea of making extra and freezing. Pinned. Thanks for sharing.